Cretzschmar first described Psammomys obesus in detail in 1828 from specimens he observed in Alexandria, Egypt. There are two recognised species of Psammomys, these being P.obesus and P.vexillaris. P.vexillaris, is known as the 'pale' or 'thin' Sand rat and was first observed by Thomas in 1925 in the Tripolitania Province, Libya.. In the past it has often been included with P.obesus, but it is in fact a separate species, as has been pointed out by G.L.Ranck in 1968 and also by E.L.Cockrum, P.J. Vaughan and T.C. Vaughan in 1977. P.obesus got it's common name of Fat Sand Rat from when diabetes was first discovered by chance observation in the specimens collected by the US Naval Medical Research Unit in Egypt. It appeared whenever the animals were maintained on a regular rodent diet. These first animals were trapped on the sandy beaches of the Nile Delta and trivially nicknamed 'Sand Rats', which is a misnomer as they are a highly specialised leaf eating member of the gerbil family. Both the common and Latin name(Psammomsys obesus) suggest that it is bulky in stature and this is certainly true of the adult males, females however remain leaner, considerably faster and more agile. Psammomys obesus has a wide distribution range and can be found in North Africa from Algeria to Tunisia, the coastal regions of Egypt, Syria, Jordan, Israel ,in parts of Arabia, and Coastal Sudan, in sandy saline deserts with sparse vegetation. Psammomys vexillaris has a much narrower range and is distributed throughout Algeria, Tunisia and Libya. P.Obesus is diurnal, being both active in the day and at night. They have complex burrow systems which have separate chambers for nesting, breeding and storage of food. Due to its environment it has evolved into a highly specialised rodent. Its staple diet is the Salt Bush Plant (Atriplex halimus) supplemented by some leguminous plants, annuals and occasional insects. It copes with the high salt intake in its diet by having extremely efficient kidneys that produce urine with a high salt intake without being toxic to the animal. In the wild they rarely drink water, having their needs met by their diet and the licking of morning dew. They appear in the early morning hours at the mouth of the burrow cleaning out dirt and excreta, and only after these home cleaning activities are done does it begin its foraging. Food is first eaten directly from the adjacent bushes (their burrows are found mainly near or within clumps of Salt Bush). Later, after their initial appetite is sated they begin to gnaw off branches and take them to their burrow. They live mainly solitary lives in individual burrows except for mothers with offspring during the breeding season which is January to April. Female P.obesus have been observed to move from one burrow to another only when food supplies near their existing burrow has become exhausted. Males have a much wider range and visit numerous burrows and often in a social context i.e., when visiting a female. Mating can often take place by chance encounter. P. obesus are active on the surface during the day in the winter months, but during the summer months they prefer the shade and can be found inside the burrow in the shade of the surrounding bushes. Often their behaviour can be different depending on where they choose to forage and live. In the Negev desert they either construct their burrows in the ephemeral river beds (Wadis) under the dense shrubs of A. halimus or on the first fluvial terrace, which is covered with widely scattered low growing shrubs of Anabis articulata. The open terraces are often used when supplies of A. halimus have been exhausted and by and large this micro climate leaves them much more open to predation from raptors. As a result, the vigilance of P. obesus remains high in these regions. Females were observed to move more, hoard more, and feed above ground much less. In the Wadis they show a much more relaxed attitude, presumably due to the taller growing A. halimus. (However these shrubs can often obstruct any attacks from terrestrial animals.) They spent more time above ground, were less vigilant, and ran less to the safety of their burrows. Often burrows built on the open terraces are more complex in nature with more entrances and occupy greater areas. In the Negev desert A. halimus and Anabis articulata made up 88% and 12% respectively of food items that were observed to be consumed at the Wadi burrows, and 6% and 80% respectively of those residing at the open terrace burrows. There are good reasons why P. obesus has evolved into a specialised leaf eating gerbil and adopting a diet mainly composed of A. halimus, these are; A) P.obesus has little or no competition for this food source from other animals or rodents; B) Their burrows are nearly always located near or at the base of plants so they therefore expend only minimal energy when foraging; and C) It can provide a more stable diet throughout the year than does foraging for seeds. In captivity these animals are very intelligent and docile creatures and apart from being an excellent research tool for science, they also make wonderful pets once their diet and environment are suitable for them to thrive. 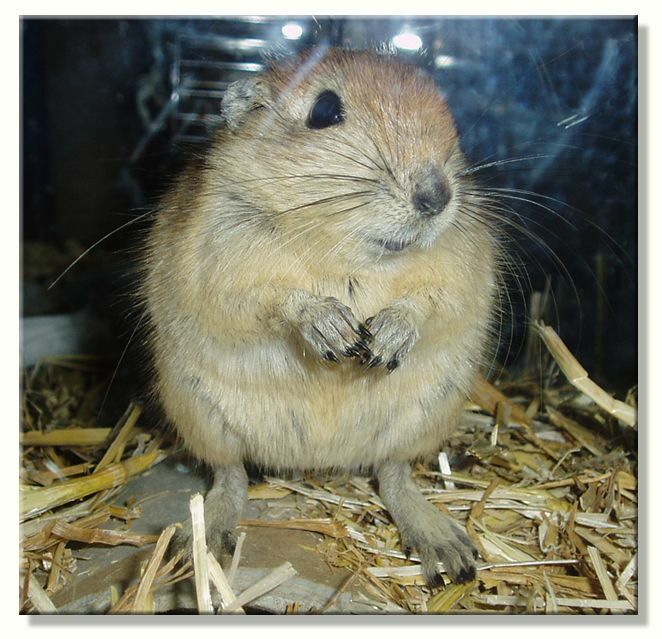 The induction of diabetes in Sand Rats suggests the value of this rodent as a laboratory research animal; however their supply to the research community is severely limited due to breeding difficulty and maintenance. To date there are only two active research colonies in the World, the main research is on obesity and diabetes, the most successful being the research on the newly discovered 'Beacon' gene, localised in the hypothalamus (a region of the brain which controls food intake). This discovery has proved that obesity is largely genetic. Research has shown that it is possible for the rodent to have a litter of 3 - 4 individuals all with different genetic composition, one pup would overeat and develop obesity, another pup would overeat and develop obesity and diabetes, and others would just develop diabetes or neither. So by environmental manipulation it provides excellent study of the genes involved because the differences in the animals have to be genetic differences. The first man to succeed in establishing a durable and reproducible colony was a Dr. Jonathon Adler who in the early 70's set up the now famous colony in the animal farm of the Hebrew University Hadassah Medical School. The animals there were originally collected from the desert area north of the Dead Sea in Israel. They were maintained on a 'free choice' diet consisting of their native desert staple, the succulent leaves and branches of the Salt Bush plant (Atriplex halimus) plus a few pellets of regular rodent chow. These animals are known as the H.U.P.O. strain in research (Hebrew University strain Psammomys obesus). As has been mentioned earlier, the most successful colony breeding to date is at the Hebrew University where they are maintained on locally cultivated Atriplex halimus plus a few rodent pellets a day, which more than effectively mimics their natural diet. However for most of us regular supplies of Atriplex halimus is impossible to get hold of. That is unless you take the trouble to grow the plant yourself! In many parts of the U.K. it is an easily grown plant, and succeeds in full sun in any well-drained but not too fertile soil. It can be grown better in a raised bed with sand added to the soil or even in pure sand. It tolerates very high salinity and can even be irrigated with salty water, which often makes it grow better. It also tolerates alkaline soils and can succeed in dry soils and windy weather. Plants will grow in semi-shade, though they will soon become leggy in such a position, and they are really best in full sun. This species was initially thought to be not too hardy in the colder areas of the U.K., but it has been found to tolerate temperatures down to -10°c and even lower. Plants can be damaged by severe frosts but they soon recover. A mature plant can be large and it resents root disturbance when mature. The plant dislikes a climate that is too wet, and is apt to succumb to winter wet when grown on heavy (clay) or a soil too rich in nutrients. Sow April/May in a cold frame in a compost of peat and sand. The seed usually germinates in 1 - 3 weeks at 13°c. Pot up the seedlings when first true leaves show, into individual pots. These can be grown on in a greenhouse/coldframe or windowsill for the first winter and plant out in late spring or early summer after the last expected frosts. These are taken from mature bushes in July/August and rooted in a cold frame or on the windowsill. This method is very easy. Pot up as soon as they start to root (about 3 weeks) and plant out in their permanent positions later in the following spring. Taken in November/December, and rooted in a Coldframe. A very easy method of obtaining plants. Pot up in early spring and plant out in their permanent position in early summer. So what are the daily requirements (energy) with a wet food-low energy diet? In several studies, P.obesus were caged individually in metabolic cages to ascertain just how much food and water they consumed and also recorded urine volume and faeces weight. The gerbils were fed either A.halimus or Alfalfa pellets ad libitum. Also in these experiments their weights were recorded 3 times in a 24 hour period. It was found that food intake was slightly higher at night, and in terms of dry weight, food intake was approximately the same in both groups,6.4g of A.halimus compared with 7.0g of Alfalfa pellets, these intakes are the equivalent to 22 and 29 Kcal per day per gerbil. So P.obesus when fed on alfalfa had a 25% higher calorie intake and also drank twice as much as those on A.halimus. According to the studies animals fed their natural staple absorbed 32.3ml of water from the leaves so secreted a much larger volume of urine. So as you can see from the composition of the commonly used low energy substitute foods (see below) a great volume has to be consumed for P.obesus to get it's daily energy requirements. All the above vegetables are accepted by P.obesus but when given a free choice they nearly always consume Spinach leaf first, the thick stems of Pak-Choi being the least favoured and usually left till last. It's interesting to know that A.halimus, like Spinach leaf has a high Oxalic acid content and is approx just over 2% of the edible portions of A.halimus, also Spinach leafs fibre content is higher than the other veg used. Spinach leaf was the vegetable of choice in early research of these animals in America and diets were based on the research of Jack Fine and Fred Quimby from the College of Veterinary Medicine, Cornell University and Dorothy Greenhouse from the Institute of Lab Animal Resources. The main drawbacks of using a low-energy wet food diet, are two fold. Firstly, although the staple foods in the diet such as courgettes, pak choi, etc, are low -energy foods, these foods may also need an additional supplement of fibre as they do not have enough fibre in them when compared to either Alfalfa or A.halimus. A.halimus and Alfalfa can be over 30% fibre depending on what month and under what climate conditions it is harvested. Secondly the wet diet includes two feeds per day, as they need very large quantities of the food for energy. This leads to a lot of urine and faeces production, which if not cleaned on a daily basis will very quickly lead to disease in the tank. A dry food diet is easily adopted by P.obesus, its advantages are convenience and hygiene in the microclimate of the tank. Also dry food gives the opportunity to give the animals a very precise, well-balanced diet. Of course one of the best staples to use in a dry diet is the dried leaves and stems of A.halimus. This can be grown yourself and dried and then frozen until use. Alfalfa has been used widely in research and has been reported above they need approx 7 g of pellets daily. Alfalfas amino acid content is very similar to A.halimus. Based on dry weight it's caloric value is 17% higher than A.halimus leaves. Purina mills have supplied a specific rodent chow for the research community for some years now. It was originally composed of a basic rodent chow, plus casein, and wheat straw. However Purina changed the formula as they found it impossible to find a clean source of it! Also their grinding equipment was modified which made it impossible to grind the straw. Since then Dr. Dan Hopkins (Purina lab nutritionist at the time) reformulated the diet and added oat hulls and Aspen flour, this chemically and physically equates the straw. These are not recommended, as protein and also fibre is too low to sustain P.obesus in a healthy state unless supplemented with other foodstuffs. With all dry food staple diets apart from dried A.halimus, a 3% salt supplement in the water supply is recommended. Animals on dried A.halimus can be given fresh drinking water. The main European diet at present is low energy foods, such as pak choi, courgettes, etc supplemented with hay. For salt supplementation some European keepers use Sodium hydrogen carbonate which is poured over the low energy foods and then given to the animals.While Sodium hydrogen carbonate is fine for providing Sodium to the animals, it can be quite limiting in providing other salts that are no doubt taken up by Psammomys when consuming it's desert staple, Atriplex.halimus (saltbush plant).The present population of European and U.K. P.obesus, and those that are used at the Hebrew University are caught around the Dead Sea regions. The Dead Sea regions contain a wide array of different salts, but they are chlorides not carbonates. These include sodium chloride, potassium chloride, magnesium chloride, and calcium chloride. There are other minerals too including magnesium bromide and calcium sulphate. I have actually used in the past a rock salt that has been mined from the Dead Sea region to supplement their food intake, but only at 3% solution, which is adequate to maintain good health. Their actual native staple A.halimus contains both sodium and potassium salts, being approx 3-4% of the fresh weight of the plant, and presumably the other salts and minerals that i mentioned above are in the plant as well, as they are growing in the same area of high salinity. The gerbil itself scrapes off the salty outer layer of A.halimus leaves which reduces the electrolyte content of the leaves but by doing this it then increases the gross energy of the plant. So the animal itself regulates its electrolyte content in the wild. Why salty water? Well initially specimens were kept on Alfalfa with plain water and there was a high mortality rate in the rodents, post-mortem results showed that the animals suffered from adrenal pathology and other signs of chronic stress. Since alfalfa contains little salt 9% ash weight versus 37% in salt bush it was speculated that they were suffering from salt deficiency and from then on a 3% raw salt solution was added to the water. As a result there was no reoccurrence of the pathology. Also as a point of note Alfalfa contains an active oestrogen (cumestrol) which might affect breeding adversely. Tests however, have shown it has no effect on breeding activities. The supplementation of Rock salt in the diet can be introduced by firstly soaking suitable low energy foods in a 3% solution of rock salt. This is done first because it will be most certain that they have been on a similar diet prior to their importation. Slowly alfalfa pellets can replace the fresh low energy food over several weeks. During this period I never give them a water bottle as all their water requirements can be met with the low energy foods given, when this is accomplished and the major proportion of their diet is dry food, a 3% rock salt solution can be added to the drinking water. A once weekly supplement of cricket/mealworms or even a small amount of white meat e.g. chicken, and a vitamin supplement are also recommended. I also use a glucose check stick (which can be bought over the counter at pharmacists) once a week to test for diabetes. By gently pressing the lower abdomen a small amount of urine is produced and this can then be tested for diabetes. Up to now all tests have been negative. Psammomys obesus are slowly becoming more available in the U.K, and the bulk of these are due to imports from Europe. In Europe there has been many wild caught Psammomys offered for sale, and with these great numbers there has been a limited breeding success with the animal. Newly captured Sand rats are usually infested with parasites. The most common ectoparasite found at capture on Psammomys obesus is Hyalomma excavatum and the most common endoparasite found at capture (in the faeces) is hymenolepis diminuta. All freshly captured animals should be quarantined and deparasitised before being offered for sale, but it is wise soon after purchase to treat for mites and internal parasites yourself, even if you know them to be captive bred. It has already been said that the breeding season is January to April, however breeding successes in both captivity and the wild are poor, and much research has gone into this. A high rate of sterility has been found in captured male specimens and despite optimum diets and a light regime of 10/12 hours dark and 12/14 hours light, breeding in captivity is still low. Gestation is approximately 24 days, and if a successful mating takes place, the mother will produce 3 or 4 pups with 75% reaching weaning age. I sincerely hope Psammomys obesus becomes firmly established in this country, on a hopeful note I have recently heard of one breeding success in the UK with this animal, with intelligent breeding plans hopefully it will become a regular feature in many Gerbil enthusiasts collections. Special thanks to Michelle Chennault of Maryland University. Establishment of Conditions for Colony Breeding of The Sand Rat. G. Frenkel, Y. Shaham and P.F. Kraiger. 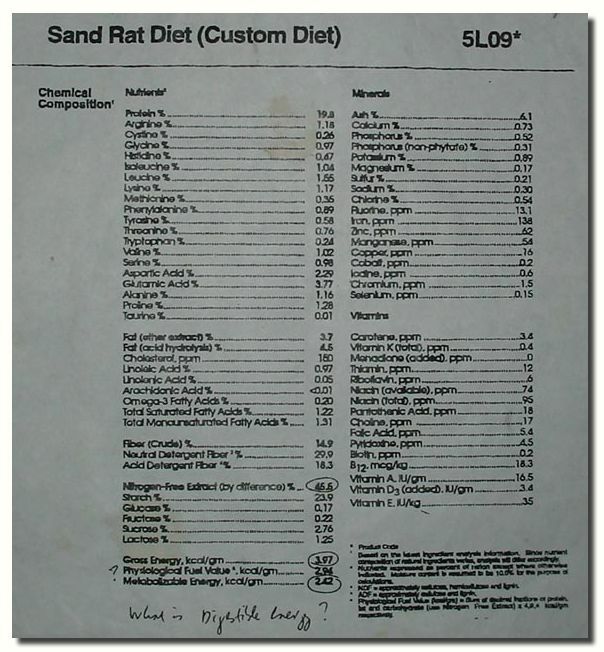 Diabetic Response of weaning Sand Rats. J.H. Adler, G. Lazarovici, M. Marton and E. Levy. Achieving predictable model of Type 2 diabetes in Sand Rats. J.H. Adler, R. Kalman, G. Lazarocici, H. Bar-on and E. Ziv. Breeding Sand Rats with a diabetic predisposition for Laboratory Investigations. J.H. Adler, Ch. Roderig and A. Gutman. Walkers Mammals of the World, Nowak.